Sea foods are my most favourite in non vegetarian items and so I buy them often, atleast twice in a month. 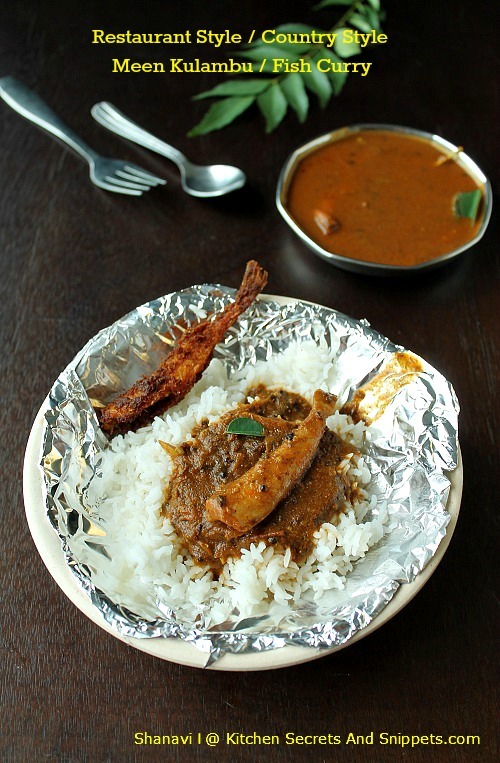 I've always made the traditional way of making fish curry , that almost everyone knows. So, it was there in my mind to try something new like the one's we get from Chennai hotel chains like Anjappar, Nala's Appakadai etc. Fortunately, I've come across this recipe months back, without a doubt, I tried it right away. The procedure was simple but it tastes delicious better than the usual way of making it. And so comes this post as my viewers are a great fan of such restaurant style recipes .. People, Njoy..
Saute the shallots in a tbsp of sesame oil until it turns transparent. Dump in the tomatoes next and saute for a minute. Add in the green chilly and saute for 10 secs, later throw in the curry leaves, saute till the leaves are fried. Cool the mixture and grind to a fine paste without adding water. Reserve the paste in a bowl. 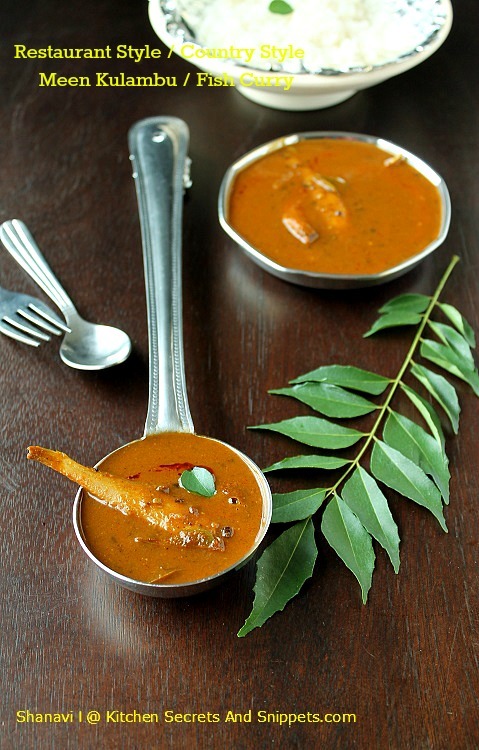 Clean the curry leaves and the coriander leaves (retain the stalks as well for coriander leaves). Grind them both to a fine paste adding few drops of water. Reserve the paste separately in a bowl. 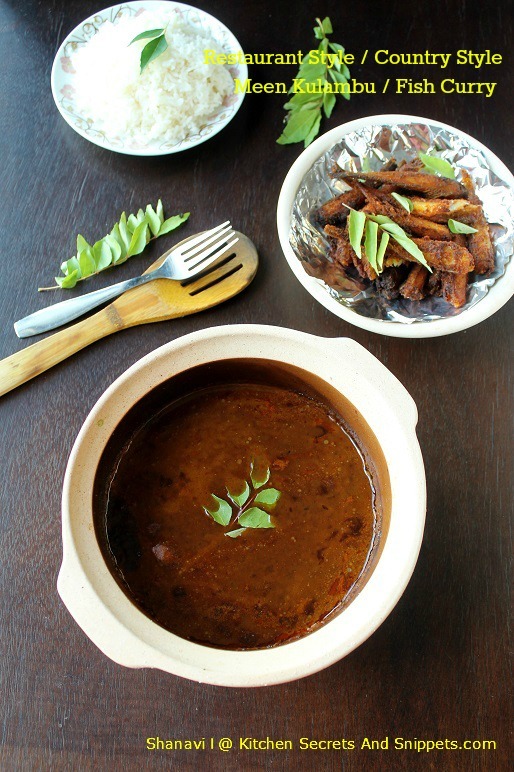 Heat a wide kadai with 3 tbsp of sesame oil and fry the Fenugreek seeds on a medium low flame. Later add in the tbsp of vadagam and fry that as well for a minute on a low flame, take care not to burn the vadagam and the Fenugreek seeds else the gravy would taste bitter. Throw in the curry leaves and the garlic pieces which are finely sliced. Cook the garlic for a minute. Add in the already made paste 1 , around 1 cup, to the seasoned ingredients and saute well for 2 to 3 minutes or until it turns to a paste consistency on a low flame. Add the turmeric powder, red chilli powder, coriander powder, salt to the masala and again saute for a minute so the raw smell of the dry spices added disappears. Now add the tamarind pulp mixed with 1/4 cup of water to the masala. Combine well so that there is no lumps. Add the 1 cup of water and mix well thoroughly. Let the gravy comes to a boil. Later add in the fish pieces one by one to the gravy. Cover and cook the fish on a low flame for a minute. Finally add the Paste 2 , around 1 tbsp to the Fish curry and again give it a boil. Switch off immediately and serve hot. Do not the cook the curry for long after putting the fish, at the max cook for 3 minutes altogether. Add about only one tbsp of curry leaves + coriander leaves paste finally to the masala, else it might be overpowering. 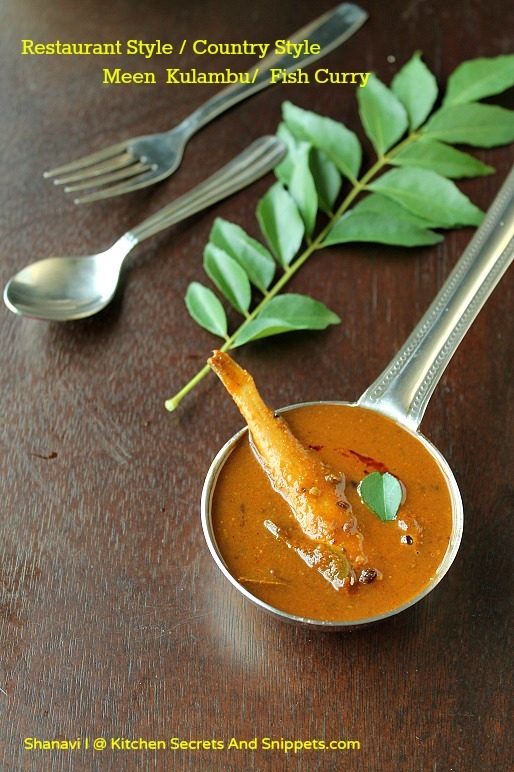 Leave the vadagam out if it is not available in ur pantry, but it gives an exceptional flavor when added. 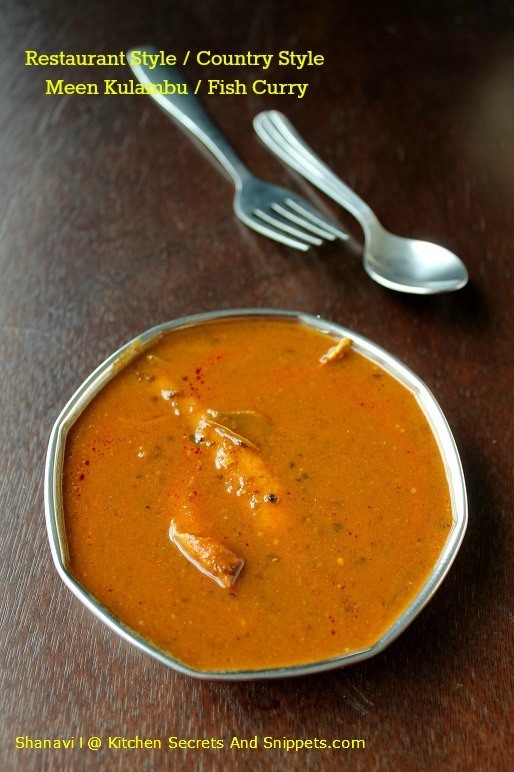 Always use sesame oil for making any Fish curry. Meen Kuzhambu looks super tempting and delicious.. Love the presentation too..
wowww sho pass me the bowl,want to taste it now itself!! Spicy and tempting kulambu,makes me drool. 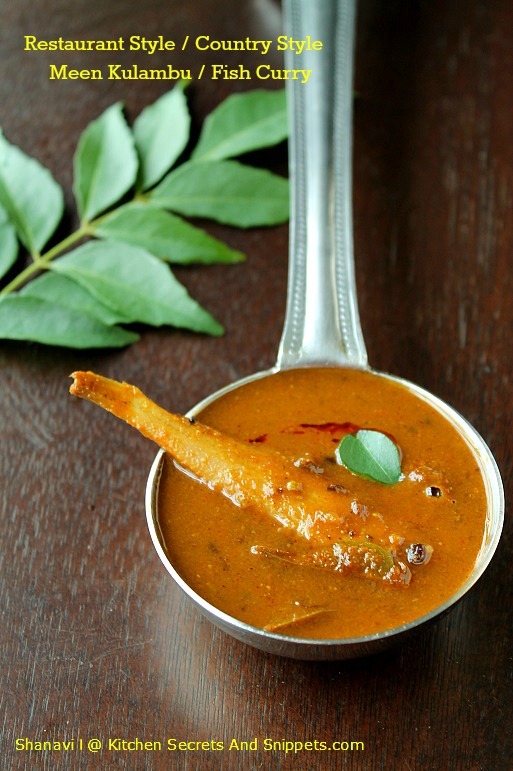 hI SHANVI..PHOTOS ARE LOOKING AMAZING NOW...SURE THIS CURRY LOOKS FIRST CLASS. LOVE TO TRY IT..BUT DIFFICULT TO FIND THIS VARIETY OF FISH HERE. Fish curry looks delicious Shanavi. Perfect meal.. you really don't need anything else...yummm!! 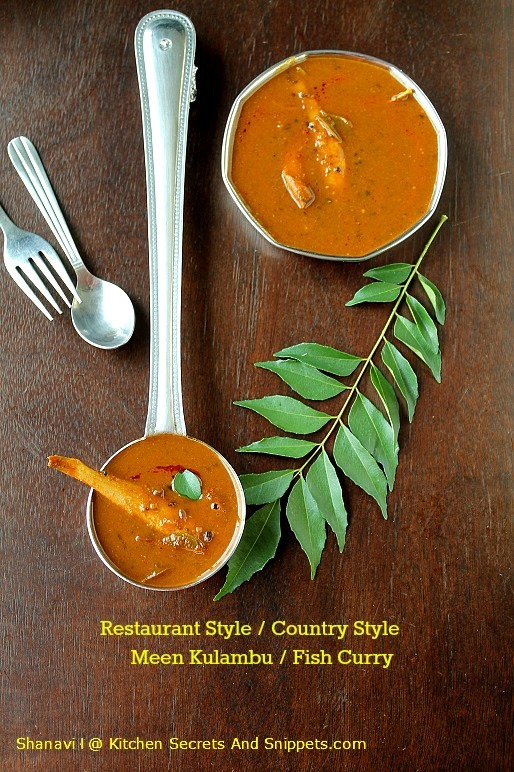 Delicious looking fish curry and mouthwatering presentation.